The C.D provides the Fiddler with accompaniment and is meant simply as an aid to learning the tunes and playing them at an accurate tempo and with an authentic feel. These tunes were all used as dance music originally and that fact should be kept in mind. Celtic music is part of the tradition that has produced Bluegrass, Western, Old Time and Country music. Listen to the melodies carefully and you are sure to recognize them. Inspired by the Celtic circles of ancient Scotland, Bonnie paints a musical picture through time, joining the heavens and earth to the cycles of everyday life. Performed on Scottish fiddle with gold medal piper Eric Rigler on the Great Highland bagpipe, Scottish smallpipes and uilleann pipes. 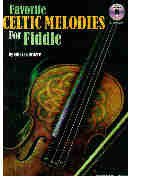 Celtic Music For Fiddle by Miles Courtiere features 35 Celtic pieces from various parts of the Celtic world. All of the pieces are dance music, jigs, reels, slides, hornpipes etc. All of the pieces were originally played on the fiddle. The book is designed to make the personal aspects of traditional Irish fiddle playing, improvisation and interpretation, accessible to novice players. The aim of the book is to allow the player to look more closely at their technique while also improving accuracy and speed.